Irony: Duke Energy is building a 75 megawatt solar farm right next to the Sabal Trail pipeline, of which Duke is a 7.5% owner. Dust no more! The same place Chris Mericle reported having a dust storm little more than a week ago, last week he discovered Duke Energy is replacing the center pivots with solar panels. SW 69th Drive and SW 40th Avenue, in Sabal Trail path digitized by WWALS. The little red dot near the center of the above map is where Duke Energy says this solar farm will go. 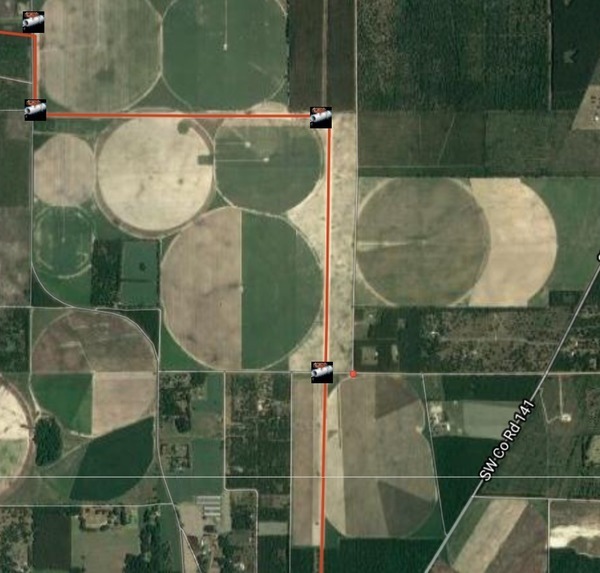 The red line is the Sabal Trail pipeline, next to the power line Duke will be using for the solar electricity. How about turn off the pipeline, Duke, and put solar panels along its right of way? As I computed using Sabal Trail’s own figures three and a half years ago, half that RoW acreage could generate just as much electricity from the sun as that pipeline would ever produce, and solar panel prices have gone down since then. Floridians to benefit from a clean, renewable solar facility in Hamilton County. Duke Energy Florida recently announced plans to build its next large-scale renewable energy project in northern Florida: the Hamilton Solar Power Plant in Hamilton County. The Hamilton project will occupy approximately 550 acres of property located along SW 69th Drive and SW 40th Avenue in Jasper. We will install approximately 300,000 solar panels on the site. Once operational, the facility will generate about 74.9 megawatts of electricity, which is enough to power more than 20,000 homes at peak production. All of the electricity created from the project will be fed onto Duke Energy Florida’s electric grid for the benefit of all Duke Energy Florida’s customers. The project is under development and targeting a start of construction in 2018. During just the first year of operation, the Hamilton Solar Power Plant is expected to reduce 300 million pounds of carbon dioxide emissions in Florida. Duke Energy will build nine or more solar plants and delete a controversial nuclear charge from customer bills, according to a widely lauded plan announced Tuesday. The article appears to be referring to an 181-page 29 August 2017 settlement agreement between Duke Energy and the Florida Public Service Commission. See also Duke Energy, PR, 29 August 2017, Duke Energy Florida files settlement agreement for building a smarter energy future. With 1.8 million customers in 35 counties, Duke is the Orlando area’s biggest power provider and the second-largest in the state; the utility, however, has lagged behind other major utilities in solar energy and had drawn criticism for a pair of nuclear disappointments. A Duke Energy solar plant. A Duke Energy solar plant. (RUSSELL AERIAL PHOTOGRAPHY /) The Florida president of Duke Energy, Harry Sideris, said the proposed initiatives worth $6 billion were filed Tuesday morning with the Florida Public Service Commission after months of outreach. Do more solar, and you’ll see more of that, Duke. The article says Duke is also planning “research and development of large batteries able to store solar energy, smart meters for all customers deployed through 2020, 500 charging stations for electric cars, improved cyber security and grid technology that would include outages detection.” Note that electric cars are distributed batteries. Details were disclosed only for the first of the plants, to be erected next year on a 550-acre tract in Hamilton County, which straddles Interstate 75 at the Georgia state line. As with all plants, the Hamilton facility would produce a peak of nearly 75 megawatts of energy, or enough for 20,000 homes. For proposed power plants larger than 75 megawatts, utilities are required to undertake an exhaustive application to prove need. At less than 75 megawatts, utilities only have to show the Public Service Commission they are cost-effective once up and running. The company provided few specifics on most of its solar power plans. It expects to start construction in early 2018 on a 75-megawatt solar power plant in Hamilton County, Fla., the company’s sixth solar power plant in the state, it said. The company owns a total of 8,800 megawatts of power generation capacity in the state, dominated by fossil fuels and nuclear power. The state has installed solar power capacity of 725 megawatts, or less than 1 percent of the state’s electricity demand, according to estimates from the Solar Energy Industries Association. The association ranks the state as having the third highest capacity for solar power but the 12th highest installed solar generation. Other major electric utilities also have announced plans recently to expand their solar generation capacity in Florida. Florida Power & Light, a subsidiary of NextEra Energy, built three solar plants in 2016, each with generation capacity of 74.5 megawatts. It plans to complete another eight plants of that size by March of 2018, adding almost 600 megawatts of solar power to the grid in Florida. Gulf Power, a subsidiary of Southern Co., finished installation earlier this year of a solar power project for the U.S. Department of Defense. The company helped install 120 megawatts of solar generation across three U.S. Air Force and Navy bases in northwestern Florida. The equipment began generating power this summer. For those concerned about what such a huge solar farm would mean local waters, air, and people, Duke already has gets power from many solar farms in North Carolina and South Carolina. The only impermeable surface is the solar panels themselves, and rain runs off those onto the ground. Usually grass grows up, and often it’s trimmed by cows or sheep. So no fertilizer, no pesticides, and once construction is complete, no dust. My previous calculation was it would only take 1030 acres to produce as much solar electricity as the Duke Power Plant’s gas turbines produce. 550 acres is halfway there. Sure, Duke’s gas plant also runs at night. Most power use is during the day. However, add a utlity-scale Tesla battery operation such as Duke seems to be hinting at, or distributed batteries in electric cars, which Duke is explicitly planning, and night power problem solved. Now when are you and Enbridge and FPL going to follow your own Duke example of the failed Levy County nuclear plant, and also declare the Sabal Trail pipeline obsolete? This entry was posted in Pipeline, Solar and tagged Chris Mericle, conservation, Duke Energy, dust, Enbridge, Florida, Florida Power and Light, FPL, fracked methane, Hamilton County, Hamilton Solar Power Plant, Jasper, north Florida, pipeline, river, Sabal Trail Transmission, solar, south Georgia, Spectra Energy, Suwannee Riverkeeper, SW 40th Avenue, SW 69th Drive, watershed, WWALS, WWALS Watershed Coalition on November 8, 2017 by jsq. They need to be very carefully watched, as their business model will realize that they can make even more money by simply exporting ALL the gas, while still doing the damage to frack it, transport it and leak along the way.